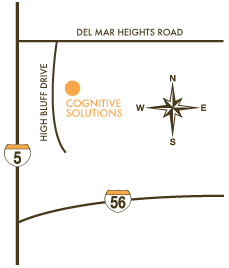 Exit Del Mar Heights Road (turn right if traveling north; turn left if traveling south). Turn right on High Bluff Drive. Turn left into the Hacienda Corporate Center. Freeway Exit El Camino Real (turn right). Travel approximately 1/2 mile to High Bluff Drive (turn left). Turn right in to the Hacienda Corporate Center.